Two shooters have been identified as Syed Farook, 28, and Tashfee Malik, 27. No motive has been identified and the pair are reported to have been in a romantic relationship. Latest update: the couple is reported as married. Executive director of the Council on American-Islamic Relations, Hussam Ayloush, says the couple never returned for baby after leaving baby with family Wednesday morning. Reports suggest that Farook was in attendance at the holiday party at the Inland Regional Center and left after an altercation with another guest. He then returned with one or two other shooters and opened fire on the group with high-powered rifles. 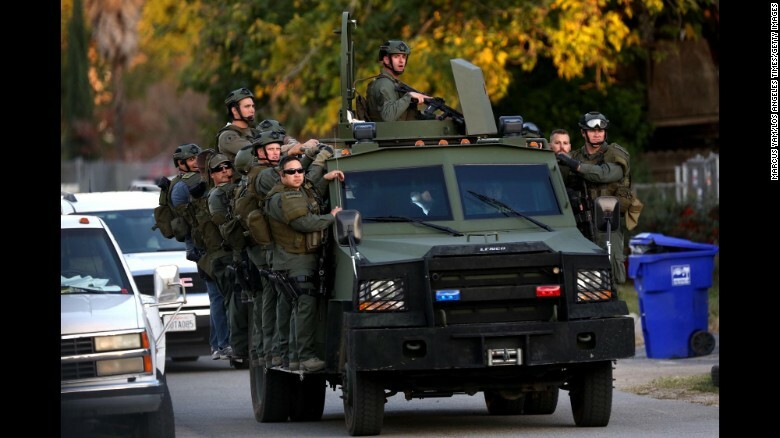 Acting on a tip, Police staked out a home nearby where Farook and Malik tried to flee the area in a black SUV. Police followed the SUV and the suspects fired weapons at police. A gun battle ensued and both suspects were shot dead. A third suspect is being held by police but there is no indication that he is involved in the shooting rampage at the Inland Regional Center. Latest update indicates there may be two shooters instead of three. FBI spokesman David Bowdich said the investigation had been adjusted to include the possibility of terrorism but that a final determination has not been made. Latest information about California shooting in San Bernardino reveals that two of the killers were shot dead by police in an active shootout. One shooter was female and one was male. At least one shooter may still be at large and being pursued in a residential neighborhood. A male individual is being detained but it is not known if he is involved in the shooting. Police Chief Jarrod Burguan reported that suspicious material was left in the Inland Regional Center where the shooters gunned down 30 people and killed 14. The material appears to be explosive and is being processed as such. Fourteen people are believed dead and more that a dozen injured in a shooting that took place in San Bernardino, California. Police Chief Jarrad Burguan said that the shooters entered the building at around 11 a.m. with “grim precision” and once inside opened fire in a conference room where a holiday party was taking place. Hundreds of people streamed out of the building, some with their hands raised above their heads and many hid behind vehicles in the parking lot. The incident lasted less than five minutes, police said. 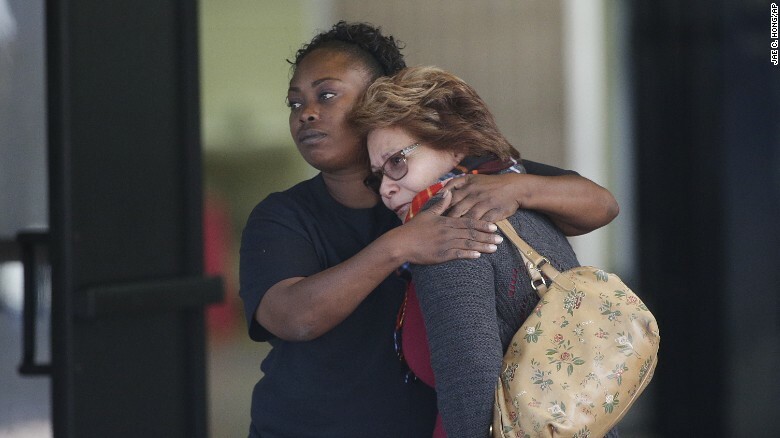 Possibly a dozen people killed Wednesday at a San Bernardino, California medical facility. Police are hunting three suspects who may have escaped in an SUV. At least 30 hostages were seen coming out of the building. Three men in masks and body armor were seen storming the building where they opened fire. The incident started just before noon local time. The Bureau of Alcohol, Tobacco and Firearms and FBI agents have responded to the scene. The attack occurred inside the Inland Regional Center, which serves developmental disabilities such as autism and mental retardation. The facility is run by the state. Police are using a robot to search the building for possible explosives. It is not clear if any or all of the suspects escaped. Police are seeking a black SUV and sources indicated authorities know the identity of at least one of the gunmen. Next: Why you should ALWAYS check your selfie before you post it!